Move over mayonnaise! This light and simple potato salad recipe makes a perfect colorful side dish for your next summer picnic or potluck party. Made with olive oil instead of mayonnaise like typical potato salads, your health-minded friends will thank you! After cooking cubed Yukon gold potatoes, toss them with tomato, olive oil, green onion, lemon juice, parsley, garlic, paprika, salt, and pepper. 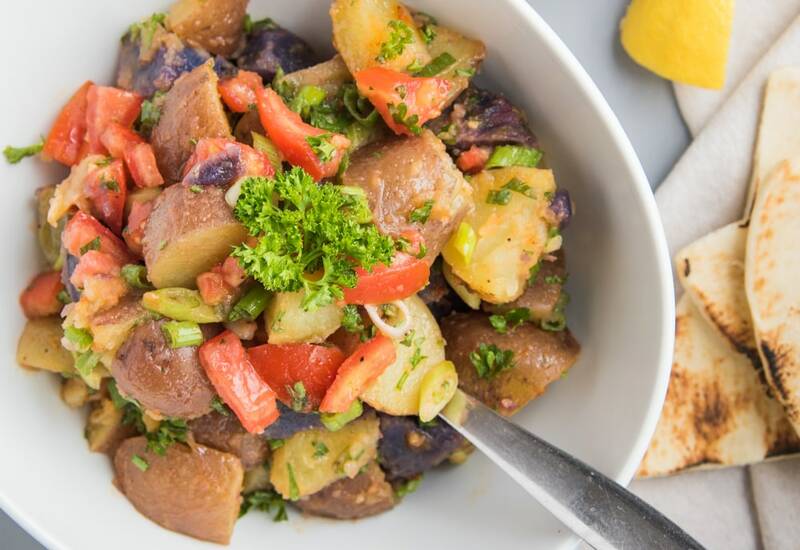 Just before serving, garnish this potato salad with freshly sliced green onion for a beautiful burst of color and flavor! For extra Mediterranean flavor, add sliced Kalamata olives or capers and crumble feta cheese on top! Serve this dish alongside grilled salmon or roasted chicken for a complete summer meal. A nice light white wine like Vinho Verde or sparkling water with lemon and cucumber would pair very nicely with this salad. Per Serving: 157 calories; 9g fat; 17.7g carbohydrates; 2g protein; 0mg cholesterol; 1157mg sodium. This salad is a complete meal in itself for all seasons- I added some red wine vinegar to the dressing for a zing! I made this potato salad for a potluck and everyone loved it! The herbs and spices are so delicious, it tastes very Mediterranean. This will be my signature dish I bring to all the parties now! This was my first time making non-traditional potato salad, without yellow mustard. I like the Mediterranean spin! The lemon and parsley are so flavorful, they definitely stand out in this dish, but it's not overwhelming. Now I know what to bring to potlucks and dinner parties, instead of store bought potato salad. I've never actually made potato salad, and usually find it pretty boring but was nominated to bring this to a potluck. The Mediterranean flavors with the lemon, parsley, and added Kalmata olives was a big hit! I used red potatoes instead of Yukon, and it worked out well. The lemon and parsley was perfect for flavor. I also used pitted, sliced Kalamata olives. So good! This was a very good salad. My husband said it was very delicious. And I served at room temperature which was nice.